A birthday party for a four year old can be so much of fun, this 34 year old just has to admit. 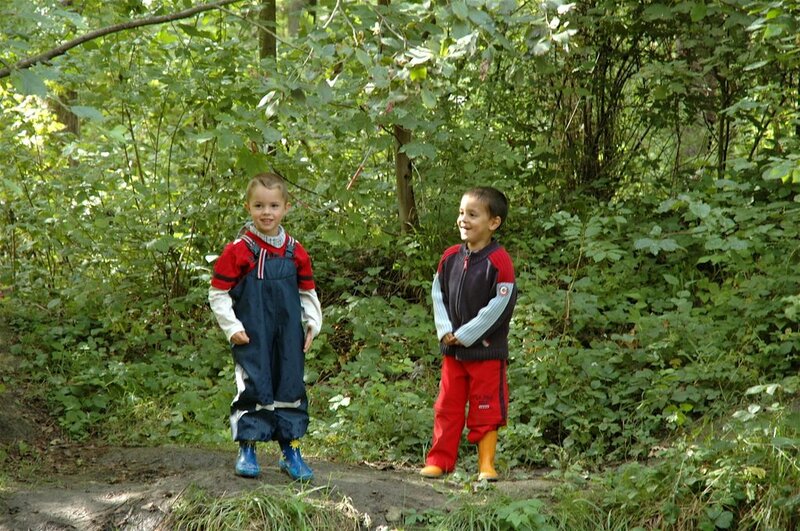 We had planned to have Soeren's party in a playground in the middle of the woods. The whole week we were looking at the skies and checking the weather forecast, as it has been a mix of sunshine, rain, warm and cold the last couple of weeks. The day before his birthday Soeren and I decided to make a few goodie bags for his KIGA group. 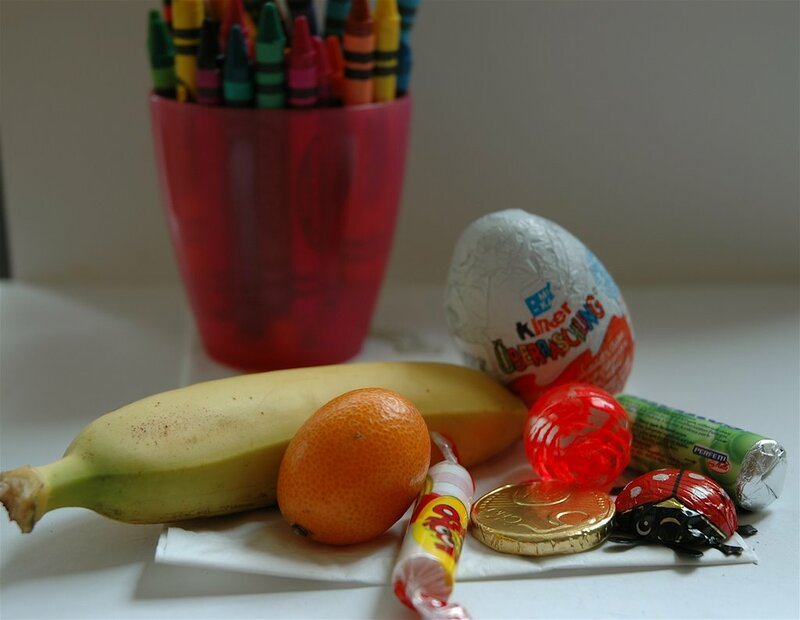 My idea was simple: Paper sandwich bags with Soeren's unique artwork on it, filled with heathy fruit, sweets and a toy. Well guess what happened? Soeren got around to drawing on two paper bags ... then his friends called him out to play and off he went. It was me who spent the afternoon on the terrace drawing with the colorful crayons. It was so much of fun! OK I admit by the time I got to the 12th bag I was glad I was done, but I was inspired and took a few pictures. 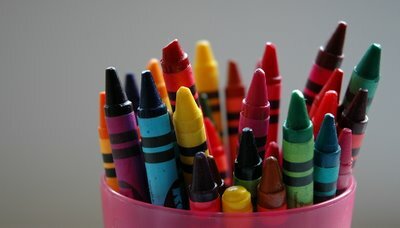 I uploaded the picture of the crayons "Colored Creativity" on to Flickr and on the same day it made it on Explore! That meant a lot! You can view my entire Explore set here. On Friday it started off with lovely warm sunshine and I was in a great mood. Soeren came down all excited and of course the Birthday Fairy had already been there! After the family birthday ritual of blowing out the candles and ripping open the presents it was off to KIGA. We brought Soeren, the goodie bags and the birthday cake to the KIGA and he was the start for the day. The weather started to change for the worse and it started to rain. Of course the parents of the other kids started to call and ask if we were still planning to have the party at the playground. It had started to clear up again and so we said we'd see it through - the playground it was to be. The sun shone and it seemed like the weather had been specially ordered for the birthday party. It was really great. The reason we really wanted to have it on this playground is because it is a little paradise for kids. 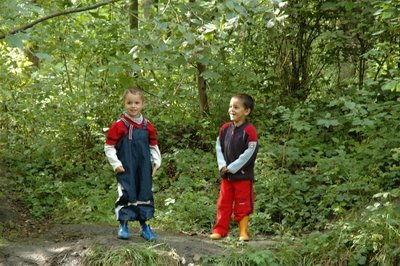 It is a type of natural playground in the middle of the woods. There are little wooden tipi style huts, a cable car type of ride where the kids grab onto a rope and the slide from one side to another and a few other great stuff. 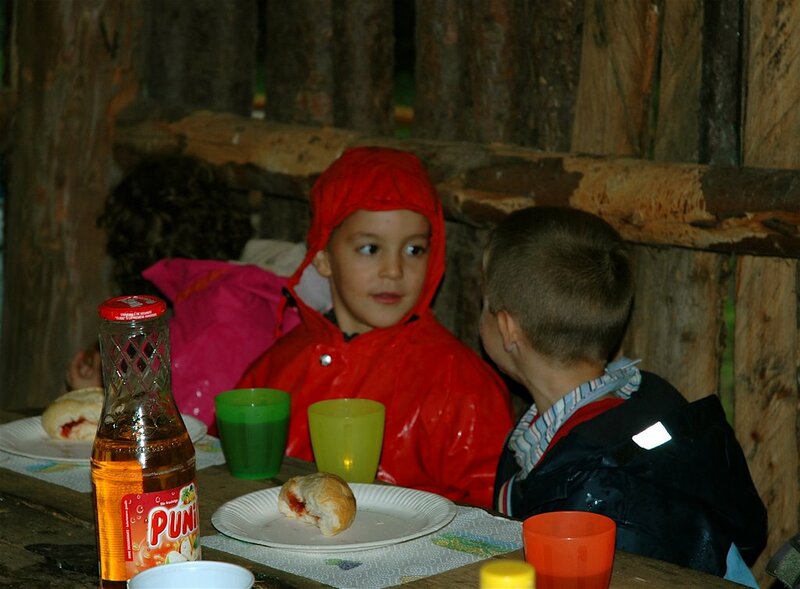 The coolest is the fact that there is a place where we could light up a campfire and grill a few sausages and marshmallows on sticks and when it started to rain again we put on our rubber wellies and raincoats and ran into the wooden lodge where there was a table made out of a huge tree trunk and wooden benches. There we ate the warm sausages with bread rolls and the rest of the cake. Then, we all sang songs and Tom read the kids a story. Once again the skies cleared up and out we all went for the last round of games and prizes. Brilliant! I had so much of fun with the kids. Running around playing games and roasting the marshmallows. I think the kids really had a great time. It was just moving to watch them having a ball. I wish I was able to share a bit of the feeling of this special day with you. I thank you all for your lovely birthday wishes you sent to Soeren. Nice to know there are so many well wishers for him out there! Very fun seeing how you celebrated, and best wishes to the birthday boy!! This is such a cute age, when they are just coming into their personality. My Belated wishes on your son's birthday. Loved the idea of a party on a playground in the woods. maybe we will copy your idea for my son's next b'day. Kalyn Thank you for your wishes! Tanna Thank you. It was a lot of fun. I'll let Soeri know that you complimented him LOL! Christine Thanks! It is important to us that we give a bit of a personal touch to these kind of things. AnuThanks for the wishes. It was a lot of fun and the best thing is they can just play around freely without anyone telling them not to touch this or that etc. Let me know how yours turned out!